Lebanese people live in one of the oldest inhabited places on Earth. It’s true – Lebanon is as ancient as the human race and Byblos is the oldest continuously inhabited city in the world. Imagine a place that’s been around for about 10,000 years; imagine what its people, experiences, stories, history, and culture must be like. But what did the food of Lebanon look like 10 millennia ago? Has it changed over the years? How? Lebanese cuisine is a never-ending search for the perfect blends, for a gold you can eat. It is one tasty alchemy, that’s for sure. Located in the middle of the Cradle of Civilization, Lebanon is the birthplace of a lot of human achievements – agriculture, urbanism, seafaring, trading… The country was always fertile ground, not just for agriculture, but also for ideas. People have exchanged ideas in the country since the beginning of human history. They have traded news, myths, wealth, values and beliefs, which has led to an enrichment and perfection of a culture. This constant stimulation gave birth to the rise of what is now the oldest urban settlement in the world. Ten thousand years of development has given the people of the oldest city, in one of the oldest countries in the world, enough time to perfect one of the most important elements of life. Yes, we mean food! 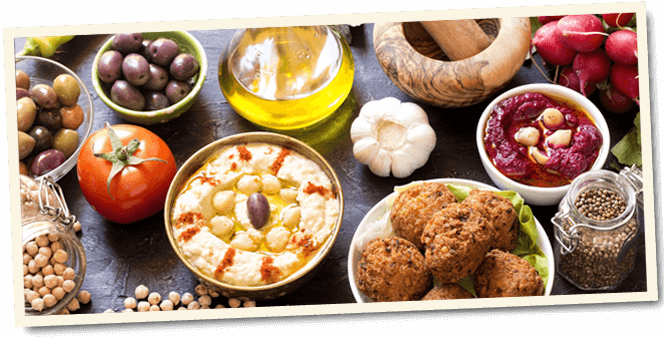 We at Muncheez are aware of how refined Lebanese cuisine is. Eating is not simply putting food in your mouth, it is a ritual that expresses an enjoyment in and an appreciation for life. Our dishes reflect these principles. Being where food cultures meet, Lebanese people hung on to the best parts of each. Refining these food cultures and mixing them with indigenous customs shaped Lebanese cuisine. Generation after generation shared their knowledge, with each generation adding their own twist on family tradition. At Muncheez we continue to explore. We are on a quest to make Lebanese food that is as tasty as it is healthy. When you try our shawarma, manakeesh, labne or hummus you will learn more about Lebanese culture and its people than anyone could tell you. Our cooking principles are simple. They are based on healthy eating, exceptional taste, and bold ingredients that are usually sourced locally: fresh veggies, fruits, grains, meat, and spices. However, the real magic happens under the skilled hand of our Chef Haidar Charaf. His decades long experience, passion, and love for Lebanese food make the difference at Muncheez. Stop by and discover Lebanon at Muncheez!